On March 5, the chief law enforcement officials from nine states issued A Report on Obama Administration Violations of Law. Nine constitutional conservative attorneys general say the report's purpose is to "outline actions taken by [the Obama] Administration that are violations of law." The report appears to be an unprecedented response to unprecedented lawbreaking. 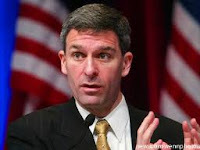 The Daily Caller quotes one of the nine, Virginia's Ken Cuccinelli, at a press conference unveiling the report: "'This is not about policy. ... [It is about] this administration's disregard for the law,' he said. President Obama and his deputies, he added, are 'the greatest set of lawbreakers that have run the federal government in our lifetimes.'" Joining Cuccinelli on the report are Attorneys General Tom Horne of Arizona; Pam Bondi of Florida; Sam Olens of Georgia; Bill Schuette of Michigan; Scott Pruitt of Oklahoma; Marty Jackley of South Dakota; Alan Wilson of South Carolina; and Greg Abbott of Texas. The report discusses the "continued disdain for the Constitution and laws shown by the Obama Administration." But it's about more than violations of the Constitution. "[T]his Administration repeatedly shows disdain for states, federal laws it finds inconvenient, the Constitution and the courts," the report adds. The report lists 21 violations of law by the Obama Administration that these attorneys general are currently fighting. That number does not include the many Obama Administration illegalities that the attorneys general have not yet begun to tackle. The report is forward-looking in the remedies the attorneys general will seek, stating: This group of nine Attorneys General will grow and continue to serve as a de facto "task force," assisting when possible to defend state laws and identifying "best practices" and legal arguments to fight back against the Obama Administration's illegalities in a more cohesive and effective manner; The next election is critically important and as the states' chief legal officers, the attorneys general will make a concerted effort to educate their states' voters on the impacts that the Obama Administration's legal violations have on their every day lives. We finally have some lawyers using the law for the right purposes. Let's get them some assistance, and grow their ranks.